The Brill Building, located at 1619 Broadway in the heart of New York's music district, is a name synonymous with an approach to songwriting that changed the course of music. The Brill Building sound came out from the stretch along Broadway between 49th and 53rd streets. 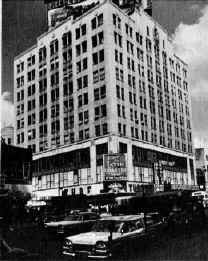 The Brill Building (named after the Brill Brothers whose clothing store was first located in the street level corner and would later buy it), was at 1619 Broadway. After its completion in 1931, the owners were forced by a deepening Depression to rent space to music publishers, since there were few other takers. The first three, Southern Music, Mills Music and Famous-Music were soon joined by others. By 1962 the Brill Building contained 165 music businesses. The Brill Building in the early '60s was a classic model of vertical integration. There you could write a song or make the rounds of publishers until someone bought it. 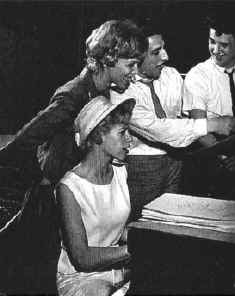 Then you could go to another floor and get a quick arrangement, lead sheet for $10, get some copies made at the duplication office; book an hour at a demo studio; hire some of the musicians and singers that hung around; and finally cut a demo of the song. Then you could take it around the building to the record companies, publishers, artist's managers or even the artists themselves. If you made a deal there were radio promoters available to sell the record.